Well we now have some of the details of the IMF package for Hungary, and interesting reading it makes. Hungary has in effect secured a 20 billion-euro ($25.5 billion) loan which is going to be sourced by three institutions: the IMF, the EU and the World Bank. The International Monetary Fund is going lend Hungary 12.5 billion euros, the European Union will provide another 6.5 billion euros, and the World Bank is chipping in with a symbolic 1 billion euros. (Really the reasoning behind the tripartite division of the loan may relate more to the pressure which it is thought might fall on IMF funding provision - which stands at about $250 billion at the present time - if more emerging market economies follow the lead of Ukraine, Hungary and Iceland. See this post here for more details and argumentation on this whole problem). The forint naturally rose - to 257.05 per euro at 9:10 a.m. in Budapest - on the news, in the process getting below the psychologically important 260 mark and very near to a two-week high. ``The agreement is designed to restore investor confidence and alleviate the stress experienced in recent weeks in the Hungarian financial markets,'' IMF Managing Director Dominique Strauss-Kahn said in a statement in Washington yesterday. “One way to look at the EU assistance to New Member States is that this is also part of the operation aimed at making sure Euroland banks don't get into trouble. The banking systems in New Member States are practically owned by foreign (mainly Euroland) banks, and if their NMS subsidiaries get into trouble, that would not be good news for the holding companies either. In the current environment that is a strong additional argument for major Euroland countries to make sure that New Member States (and their banking systems) do not get into trouble because of the liquidity crunch." “We expect the EU and the IMF to announce additional rescue packages for other Central and Eastern European economies in the coming days and weeks. Top of the list are the most imbalanced countries in the region - the Baltic States, Romania and Bulgaria." “All in all, the crisis seems to have been averted and even though it is no doubt a major shame that Hungary got to this situation, the authorities managed well in the rough waters, far better than Iceland (major policy mistakes in particular by the CB), Ukraine (political fragmentation still a major problem, currency peg had to be abandoned after failed interventions) and Romania where politicians remain ignorant even now, after the problems are more than evident. Bulgaria also does not seem to be prepared, though the currency board, the fiscal reserves and the significant budget surplus at least provide more cushion." Of course, none of this comes free. In effect the IMF is providing Hungary with a 17-month stand-by agreement, and just the fee for making the stand-by available will be 0.25% of the total quantity per annum, according to information provided by Central Bank (NBH) Governor András Simor in a press conference this morning (Wednesday). The rescue package is available up to the end of March 2010, with 3-5-year repayment period and an interest rate of 5-6% per annum (fixed). And then, of course, there are the conditions. The International Monetary Fund (IMF) has effectively imposed two conditions on Hungary in exchange for the package, according to Prime Minister Ferenc Gyurcsány addressing a press conference yesterday (Tuesday). 2) Hungary should not embark on measures that could have a negative influence on the revenue side of the budget (e.g. extensive tax cuts). Hungary's Finance Ministry has accordingly lowered its 2009 public sector deficit target down to 2.6% of gross domestic product, from the already previously reduced goal of 2.9%. In fact the Hungarian cabinet had recently rewritten the 2009 budget draft (which in any event still needed to go before parliament) due to the pressure on Hungary's financial system, lowering the deficit goal to 2.9% of GDP from 3.2%). Really all this does seem incredibly ritualistic, since I for one am hardly convinced that coming down from a 3.2% deficit to a 2.9% one is going to be all that earth shattering in terms of the economic results produced, although it will of course provide some nice red meat to feed to those ever so hungry external investors, who, if they think the fiscal deficit is at this point is the main issue in Hungary, far from being the shrewd and caluculating economic actors assumed by rational agent theory simply have no idea of what is going on at this point in time. The fiscal problem arose much earlier in the day and Hungary's government has been struggling to put it right, operating a deficit reducing policy since the summer of 2006, and had managed to cut the shortfall to 5 percent of gross domestic product last year from 9.2 percent in 2006. The 2007 target has also already been reduced to 3.4% of GDP from 3.8%, so I can hardly imagine what positive macro economic benefits people expect to see from turning the screw even more on an economy which is already reeling under the extent to which the screw has already been turned. The main problem facing Hungary right now, apart from its very large external funding requirement, is really the fact that the civil population have become addicted to taking out their debt obligations in foreign exchange - largely Swiss Francs - and the flow of these is now drying up as the banks get scared about the downgrades they can get from any write-downs they may have to do. So the what the Hungarian economy needs now more than anything else is external support to ease the economy off the external borrowing steroids which have been being pumped into the household sector, and it is not clear to me how the IMF package is going to help with this. At least at this point it isn't. One way forward which many are considering right now across Eastern Europe is early euro adoption. The Hungarian government and the central bank have now pledged to meet euro- adoption requirements for the deficit, inflation and national debt by next year. Hungary still doesn't have a target date for the switchover to the euro, due to the earlier deficit overruns and ongoing inflation issues, but given that we are now likely to see sustained GDP contractions, deficit reductions and price deflation rather than inflation, I doubt Hungary will continue to have difficulty meeting existing EU/ECB criteria in the future. The issue is rather going to be, what sort of shape will the Eurozone itself be in when Hungary finally does get the opportunity to officially present its application form? Naturally all these cuts and withdrawals of bank funding will have substantial consequences for the real economy and it is not without significance that Gyurcsány also stated yesterday that, in his opinion, the foremost challenge Hungary must now tackle is how to avoid mass employment layoffs, as corporates are cut back or suspend production in the face of the developing recession both within and without of Hungary's frontiers. He described what was currently happening in Hungary as “the gravest economic and financial crisis of the past 80 years", and for a country which has obviously suffered so much that is really saying something. The sad part is that I find it hard to disagree with him. Gyurcsány also said Hungary should brace itself for a European and global environment where combating recession, rather than achieving growth, has become the watchword. “Hence neither will the Hungarian economy grow," he said, noting that the 2009 Budget has been drawn up under the assumption of a 1% GDP contraction during the coming year. Actually even this forecast appears to be optimistic, and Gordon Bajnai, Minister for Development and Economy, pointed out that the International Monetary Fund (IMF) had suggested "pencilling-in" a 2.5% GDP fall for 2009. This idea was obviously put forward with the idea of making a "worst case scenario" assumption on which there would have been no backsliding (thus getting all the bad news out of the way at once), but again unfortunately, the worst case scenario also appears to be a highly probable one at this point, and while really we should avoid getting into the game of bandying about numbers just for the sake of bandying them about, I personally have pencilled in a drop of between 3 and 5 percent in Hungarian GDP for 2009, since, among other issues not really being discussed at present, I am also expecting a very nasty shock to hit German GDP on the rebound from all the crises which we are seeing unfold in one country after another across Eastern Europe. Obviously the IMF do not spell out the details of just how Hungary can make the sort of budget cuts which are now going to be required of it, but there is no doubt that they will be painful. Among the proposals which are being floated around are the scrapping of the 13th month wage civil servants receive and a halving in the 13th month pension. Many observers have been surprised by the size of the loan, but as Lars Christensen (Danske Bank) notes, the size does gives us some indication of how the IMF see the financial crisis as being significantly greater in Central and Eastern Europe than most market participants have been willing to accept until now. Anne-Marie Gulde-Wolf, IMF's Division Chief at the Monetary and Financial Systems Department and Elena Flores, European Commission Director, both stressed - at a press conference organised by Hungary's Finance Ministry - that the EUR 20 bn facility was a credit line and Hungary would not necessarily be drawing on it if market and macroeconomic conditions were to improve or normalise (although since there is not much likelihood of this happening in the near term, it is not unreasonable to assume they will need to draw on a significant part of the loan). What they said in effect was that they wanted to give the markets a "strong sedative" at this point, one which was strong enough to make people think twice before acting. The 20 billion euro figure considerably increases the 17 billion euros of existing reserves available to the NBH for covering external payment obligations which for the next 12 months are estimated at around 32 billion euros. This 32 billion is, howvere, another worst case scenario, assuming that the foreign owners of the Hungarian banking sector completely cut access to financing (not totally improbable, or at the very least new financing is going to be greatly reduced) and that import levels remain unchanged despite an potentially contraction of exports (much less likely). This line of thinking is reinforced by András Simor's statement today that the financial package is a credit line which if drawn on will boost Hungary's foreign currency reserves. Simor underlined that if Hungary draws the full amount available the bank's foreign currency reserves would more than double. Simor also stressed that any decision to use the credit would need to be taken by the government. In order to put the size of the loan into some sort of perspective Simor said it is: - twice as large as the stock of Hungarian government securities held by non-residents (currently around HUF 3,000 bn); - about five times as large as the country's external debt maturing next year; - about one third of Hungary's total government debt. Why Do I Call This A Straight Jacket? Basically Hungary is about to take some extremely tough medicine, medicine which in the short term will see GDP actually shrinking. To put this in perspective, I think we need to remember that Hungary is a comparatively poor emerging economy, with per capita incomes way below the EU average. Thus these cuts will really be felt, especially any cut backs on pensions or health facilities, since remember Hungary is already a rapidly ageing society, with a comparatively short male life expectancy (ie poor health among older males), and all these cuts will not make this problem any better. “At the same time, there is no doubt that to ensure Hungary's long-term survival a major diet is needed (this is in fact true to every emerging country which experiences the same problem)." “The thirst for debt financing, domestic or local, has to be drastically reduced and not just for a period of a year but for longer, given that credit markets are not going to be the same in the foreseeable future as they had been before the world 'subprime' become known outside the circles of the debt securitization market." “This implies not only a reduction of the public debt but also the substantial reduction of the deficit of the current account which implies a major diet for consumers (how much is needed exactly is highly uncertain, given that the massive errors and omissions row on the C/A statistics render the C/A figures rather meaningless)." “While the increased credit costs and the restricted credit availability will drive demand down, a key tool to rebalance the economy is the exchange rate. Hungary needs a week forint to ensure the sustainability of financing and in this anti inflationary global environment the NBH should in our view be ready to accept a slightly slower paced disinflation to allow the financing thirst to reduce and ensure the long term sustainability of growth." 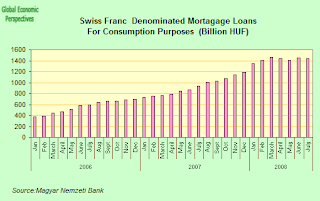 So basically, and in a few words, domestic private consumption - which has already been very, very weak following the "austerity package" of 2006 (what I am calling the hair shirt) - is now going into full speed reverse gear, as all those personal consumption swiss franc mortgage loans come to a dead stop. 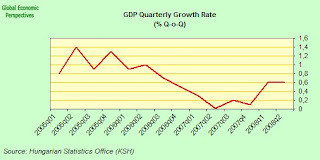 Government spending is also going to go backwards, as the deficit is cut and cut, over a GDP which is itself reducing. And exports - the third platform of any economy - is also set to go full speed reverse, as Russia and the other EU countries all shoot off into what is probably going to be quiet an important recession. As Gabór Ambrus says, Hungarian consumers are about to go on quite a drastic "diet", and the only way forward is through exports, which means a weaker forint (god, how I have been tirelessly arguing this on this blog since late 2006), which means all those swissie mortgages have to go (ditto), which means some of these banks will need to take a substantial haircut on the write-downs (good job the EU is on-board then). And on and on, or down and down we go. 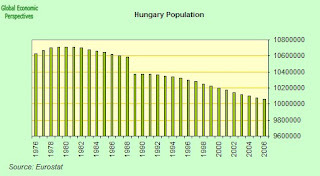 Of course, with population in decline anyway, when exactly will we see GDP growth again in Hungary???? Obviously one last point which is worth making on this most hectic of hectic days, concerns monetary policy. As we know the central bank base rate is currently at the ridiculously high level of 11.5%. But does this now make sense, and in particular if you want a weaker forint? Well some comments from central bank governor András Simor earlier today seem to suggest that changes may well be on the way. “In this new situation monetary policy makers will need to rethink which way to go from here," Simor said. The Central Bank Monetary Council, Simor noted in his press conference, is faced with a “new macroeconomic situation" in Hungary due to the changes that have taken place in the world economy. The rate-setting body he assured his audience will carefully analyse the processes and draw its conclusions in the coming one to two months. That is, you have been warned. Well, I think that will do for now, but don't any of you dare complain that you haven't had the priviledge of living in "interesting times". Fascinating, I would say, especially for those of you with sufficient interest to learn from them.